UFW Stories: "UFW Efforts in Texas 1988-1992"
"UFW Efforts in Texas 1988-1992"
I met Rebecca Flores Harrington, Regional Director for Texas, in 1988 outside a HEB grocery store in San Antonio. She along with other UFW members were handing out boycott fliers. I had just completed my graduate work at U.T. Austin and was anxious to get involved in community activism. Rebecca wasted no time in getting me involved with UFW. I worked for 4 years helping promote the cause of the Farm Workers. My job was Union Organizer and I set up pickets at HEB stores around San Antonio, visited local schools, churches and union halls, spreading the message of the Farm Workers and Cesar’s goal to stop the use of deadly pesticides, to promote boycotts of grapes and lettuce and, most importantly, expose the terrible treatment Farm Workers received, and the struggle to right this terrible wrong. When needed or directed by Cesar and/or Artie I also went to El Valle,and Dallas. The pay was minimal, but the personal and professional grow I made while working for UFW was priceless. The experience I had with UFW had a profound impact on my life, my character and my commitment to helping Farm Workers (and their families) .What impressed me most was the Farm Workers; dedication, tenacity, integrity,their sacrifices and an unwavering resolve to get respect and fair treatment for the job they do. I felt obligated to use the education I had received to do the best I could to help their cause. One Saturday afternoon, Rebecca called me and said, “Hey Hilda, can you come to Dallas, and get arrested with us. Cesar wants to know if you can come join us in getting arrested?” I was speechless for a few seconds. Unsure of what I had just heard. I asked, “Did you say you want me to drive to Dallas to get arrested by the Dallas Police?”. “Yea”, she said. “It’s no big deal, we (meaning Cesar and other UFW members) are planning it”. Imagine, my explaining to my husband, “Oh, honey, I need to leave to Dallas immediately, Rebecca wants me to drive there so I can get arrested”. After his initial shock, (and my explaining that we would be freed on bail), he reluctantly agreed to help me get the car ready for the long ride. All of us spent the night at a local church hall and left the next morning expecting to get arrested at a local HEB. Upon arriving at the store Cesar and Artie directed us to line up with boycott posters and approach shoppers as they entered the store. We were unaware that numerous police vans were concealed behind the store, ready to arrest load us us. We did see that police were posted on top of the roof of the store and a few were in near by patrol cars waiting. Several hours passed, but the police ultimately did nothing. Having succeeded at picketing the store, we proceeded to leave and then notice the police vans pull out from behind the store and leave immediately. I was relieved, but strong in my conviction to stand firm with the Farm Workers. 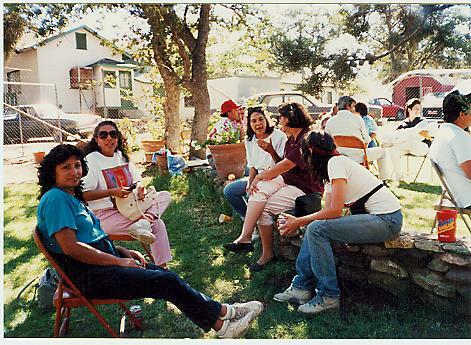 My husband and I have other memories, like the times we attended the UFW union meeting in California and enjoyed an afternoon at Cesar’s home with other UFW members having a large picnic and playing solftball. My husband and I eventually moved to Southern California, where I worked as a bilingual teacher, and got the opportunity to support the children of Farm Workers and share UFW message of how Farm Workers continue to struggle to gain, a safe work environment, fair treatment with my classes. My husband and I are looking forward to attend the 50th Year Anniversary and seeing old friends.